Czestochowa, 100 km from Krakow, is famous for The Jasna Gora Monastery, one of the main Catholic pilgrimage destinations in the world. In 1382 the Pauline Fathers were summoned to Jasna Góra by Prince Ladislaus of Opole and given the miraculous Black Madonna painting to keep it safe. The monastery, situated on a hill and surrounded by bastions, is also the national shrine of Poland and the center of Polish Catholicism. 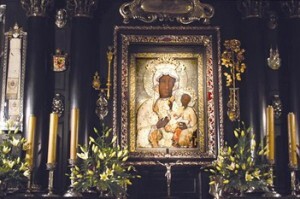 However, the pilgrims don’t focus on the monastery itself, but on the icon, displayed in the main altar in the Chapel of Our Lady of Czestochowa. According to a legend, the icon was painted by Saint Luke, then travelled to Jerusalem, Constantinopole and Beltz, to be finally brought to Czestochowa by king Ludwig the 1st of Hungary. The Madonna is honoured because of many miracles which are believed to have happened through her intercession. The walls in the chapel where it is kept are all covered with votive offerings brought by pilgrims. During the Great Northern War, Częstochowa was captured by Swedish army in 1702. In February 1703 Swedes besieged the monastery, but failed to seize it. In September 1709 the Swedes reappeared at the monastery. Unable to capture the fortified stronghold, they looted villages in the area and set Czestochowa on fire. After the Swedish siege, the painting was crowned Queen of Poland, as she was credited with saving the monastery. Apart from the chapel, the complex contains also the impressive basilica, Knight’s hall, belltower, museum, arsenal and treasury.